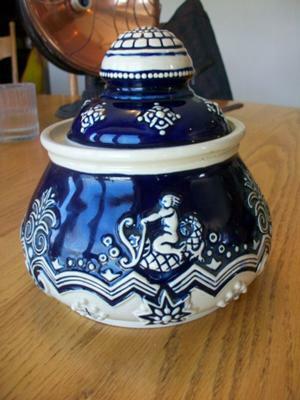 I found this blue and white pottery jar at a thrift store and was intrigued by its beauty and theme. The decoration featuress a figure, that I assume to be Neptune, riding a sea serpent along the outside of the jar. 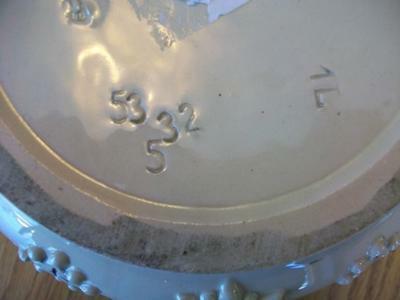 There are several manufacturers marks on the base of the jar. The maker’s mark has a sligtly mis-shapen rectangle with a T shaped figure inside. The horizontal line of the T hangs low on the vertical line. The vertical line reaches outside of the box and is crossed with another horizontal line. There is a small arrow or initial shape at the top of this line. 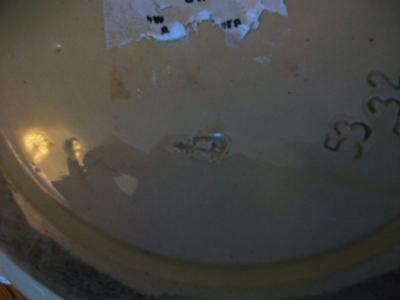 Near this mark the letter “A” is handwritten into the surface. The numbers 53, 32, and 5 are also stamped as well as 1L. Any information that you could give me about this piece would be very much appreciated. We have a similar blue and white pottery with a flute player – no idea of age or provenance? Upon further examination, I would say that the maker’s mark on the blue and white pottery resembles an arrow inside of a square.